Please note that you are entitled to cancel your order and return the goods within 7 days for a full refund, which may include the cost of delivery. 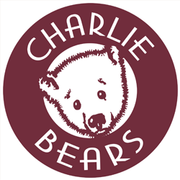 Please do this by contacting us by email (sales@charliebears.com) or telephone (01566 777092). Please note that you are responsible for the cost and risk of loss or damage when returning the goods, so you should take out enough postal insurance to cover their value and send all goods on a tracked and signed for service. The cancellation policy does not affect your rights when we are at fault - for example, if goods are faulty or not accurately described. Any goods returned should be in sale-able condition, with any seals and wrappers unbroken. These terms apply to your order and we may change our terms and conditions at any time. If any term is held to be invalid under any applicable statute or rule of law, that term is automatically omitted from the terms to minimum extent necessary to comply with the law and without affecting the validity or enforcement of the remainder. It is essential that you complete our returns form ensuring that you answer all the questions and send it back to us together with the product you wish to return to the address below. Please note that products returned without a returns form will not be dealt with until we receive the completed form from you. A returns form should be included in with your bear and if this is missing then please print one by clicking HERE.